Everton suffer a disappointing 2-0 defeat to West Brom at the Hawthorns. 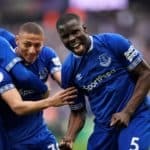 Everton exerted most of the early pressure, with the powerful duo of Marouane Fellaini and Nikica Jelavic pinning back the West Brom defence. Ben Foster remained untested, however, despite the crosses aimed into the box and referee Jon Moss rightly waved played on when Jelavic appealed for a penalty under the challenge of Claudio Yacob. It was West Brom who eventually had the first real chance of the contest having grown into their passing game as the half hour mark approached. Shortly after Graham DorransÂ´ through ball had just escaped James Morrison, Long rattled the bar with a header from Liam RidgewellÂ´s excellent cross. The substitution of Darron Gibson, who suffered an injury, was a factor in the deterioration of EvertonÂ´s performance and control of possession in the first half but even when they did reach the penalty area, West Brom centre-backs McAuley and Jonas Olsson competed strongly with Fellaini and Jelavic. Their defensive solidity was nearly rewarded when Morrison found space in the centre of the pitch to advance at goal, rounding Sylvain Distin on the way, but Tim Howard made an excellent save to deny the Scottish midfielder. 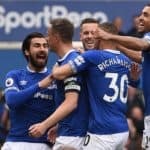 Everton continued to edge the possession stakes in the second half and finally created a chance of note when substitute Kevin Mirallas rolled in a cross from the right that Fellaini clumsily blazed over with his left foot when unmarked at the back post. West Brom had introduced a wide forward of their own from the bench in Odemwingie, and the Nigerian created the first goal in much the same way as Mirallas had laid on that gilt-edged chance for Everton. Escaping the attention of Hibbert down the left, he fired a low cross into the box that evaded Phil Jagielka and was tapped in by Long from close range. Victor Anichebe was added to the Everton attack as Moyes attempted to find a spark of inspiration but McAuley, Olsson and company held firm. Indeed, it was West Brom who looked more likely to exploit the space left by EvertonÂ´s raids forward, with Yacob and Mulumbu going close from distance. And when the latterÂ´s shot was palmed behind by Howard, McAuley stole in front of the goalkeeper from the resulting corner to seal the points and continue West BromÂ´s superb start to the season.